I'm still using these. Great, great irons. I've tried a lot of the current irons and I can't see any reason to change. Used ALL other manufacturers...fall well short. Swapped from blades to these gems in 2000 and still using them in 2015. Very soft feel but very strong clubs. I have 1-SW and love all of my irons particularly the 1-3. Soft metal so need to keep these apart in 14 hole bag so they don't rub or hit each other. Clean regularly with mild soap and soft toothbrush and they still look brand new. I don't think there is a better club on the market. The shafts I use are Dynamic Gold S300 with sensicore (Original shafts). Have read all the reviews which are positive and can only agree that I have the best set of irons for me. I am 61, play off 4 and have not lost any length or accuracy with these irons. Very simple and attractive appearance compared to other offset clubs. Cannot fault these clubs. Bought my irons from the local pro in 2000 for around $100 per iron. 1 and 2 irons were not standard and had to be pre ordered. Tried Callaway, Titleiist, Cobra and Taylormade but they fall short of the Maxfli Revolution model in appearance, feel and playability. Interesting, My son, HS golfer uses Mizuno MP 53. Great club, great feel. When I compare them to my old Maxfli Revolution Black Dot,they ave very similar in look, feel, and performance. I still use my Maxfli Black Dot. They are awesome. Best clubs I have ever had and there 25 plus years old. i started to play golf in Oct 2012, and back then i had a set of Taylormade Burners, GI clubs.A couple of months later i bought these clubs, my handicap was 30 plus shall i say and now my handicap is around 16. Two qualities that stand out in comparison to any other irons are FEEL and ACCURACY. I had the NS Pro stiff shafts in them all the while and never bothered to get properly fitted until today. The fitting pro told me that the loft and lies of the clubs were extremely off and the 7i had a D0 swingweight while the others had a D3 or a D4. He is going to get me fitted needless to say, probably with the DG S300 or X100 tomorow, so I just cant wait..Maxfli Revs are a no brainer when it comes to value for money, but if you dont mind spending some cash, there are some better irons out there, like the titleist MB 714's, TaylorMade TP MC's and MB, and Tourstage X Blades. Mis hits on these irons can give u some pain in the arms, for me it is the right arm, so this is definitely a factor to consider. High launch and high spin are issues a player should be able to control with shot making skill so you cant blame the Maxfli's but they do have high launch and spin. I've had my clubs now for well over 12 years and despite the fact that I keep being told to upgrade to technologically advanced clubs I have found nothing to beat mine.I've tried Mizunos and Titleists as demos but even though they're close they don't have the same feel and balance. When you strike it purely you know every time. My clubs will wear out eventually. What I'll replace them with I really don't know - they're great. I now have 2 sets, they look great they feel great, and wow do they go well. I prefer the Rifle 5.5 shafts, just the right stiffness. I was toying with changing to something more forgiving however after reading the reviews, think I will stick where I am. Had these irons for sometime now. Other moden day irons on the market and you would agree. But they don't need it and nor do you believe me. And really the only thing that came close to the maxfli where the mizunos. If you are looking to change your irons you really must try these. You will not be disappointed then you can buy a secondhand set for next to nothing and save yourself a fortune and have the best iron set ever made in your bag. 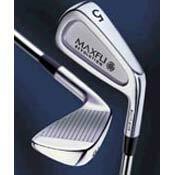 New moden irons just don't compare to the maxfli to me.